Guest Complaints? Face to Face is more a more direct approach. « Credit Card Processing – Are You Paying too Much? Remember William Buckley Jr., the conservative political commentator and author? He had a command for the English language unlike no other. Here is what he wrote in an essay about why people don’t complain face to face. “…we are all increasingly anxious in America to be unobtrusive, we are reluctant to make our voices heard, hesitant about claiming our right; we are afraid that our cause is unjust, or that if it is not unjust, that it is ambiguous; or if not even that, that it is too trivial to justify the horrors of a confrontation with authority; we will sit in an oven or endure a racking headache before undertaking a head-on, I’m-here-to-tell-you complaint. That tendency to passive compliance, to a heedless endurance, is something to keep one’s eyes on — in sharp focus.” 1961 Essay ‘Why Don’t We Complain’ by William F. Buckley Jr. Remember this was 1961, decades before social media and all the outlets we have for anonymous complaining. I wonder what he would have thought about Trip Advisor and Facebook? As consultants, The B&B Team has the opportunity to listen to innkeeper’s stories about guests who have checked out and appear happy as can be. Then a few days go by and they receive an alert about a new review posting. Behold those happy guests were really NOT happy and their complaints get posted and go out there for all to read. It hits you up side of the head and in your gut, right? So why didn’t these folks just tell the innkeepers about their issues during their stay? Most innkeepers would gladly do everything in their power to rectify any negative situation. Just like Mr. Buckley writes, most people don’t like to complain face to face because it feels confrontational. Is this a bit cowardly? I don’t think so, just human nature. The dis-satisfied guest will leave your inn feeling they have not received a good value for what they have paid for. Remember, true or false, their perception is their reality. Is the complaint legit or an emotional rant? Let’s go back a few years before the social media phenomenon. A piece of paper in a guest room with a title ‘Guest Questionnaire’. Many innkeepers still provide this outlet, certainly hotels and airlines do. This may not be face to face communication but it is still a more direct guest to innkeeper approach. Your response can also be more direct and personal. Note: This should not take the place of encouraging your guests to post on social media outlets. Those glowing reviews pilling up help your business and help you manage your reputation which can result in bookings. This non tech suggestion is just another way of receiving customer feedback. Was check-in prompt and courteous? Was the cleanliness of your room satisfactory? Was the room temperature comfortable and controllable? After receiving a negative (or positive) comment from a questionnaire you can then email or call and discuss the complaint and then take action. Communication is key. Listen and respond and set emotion aside. 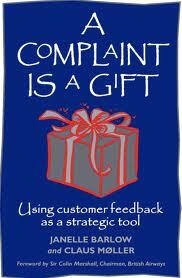 In conclusion the reality is there will always be complaints and dis-satisfied customers. This is human nature and the nature of doing business. 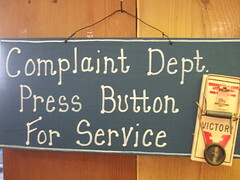 In general complaints are also a normal part of being in relationships with people. Our bed and breakfast world of the hospitality business is very personal and face to face. The key to success is in the perceptions (there is that word again) of your guests. If you can recognize during their stay any hints of dissatisfaction you can then ask them face to face if there is anything you can do to make their stay better. By understanding them better you can move forward and take action towards an improved and ‘Better Way to Stay’ inn. This entry was posted on Monday, June 25th, 2012 at 6:01 pm	and is filed under Innkeeping Business. You can follow any responses to this entry through the RSS 2.0 feed. Both comments and pings are currently closed.